The DNR's management challenge is to increase the number of newborn moose calves that survive to become productive adult females. Examining the reproductive success of moose is essential to understanding changes in population size over time. That is why, in 2013, the DNR launched an important study of reproductive success of northeastern Minnesota's declining moose population. 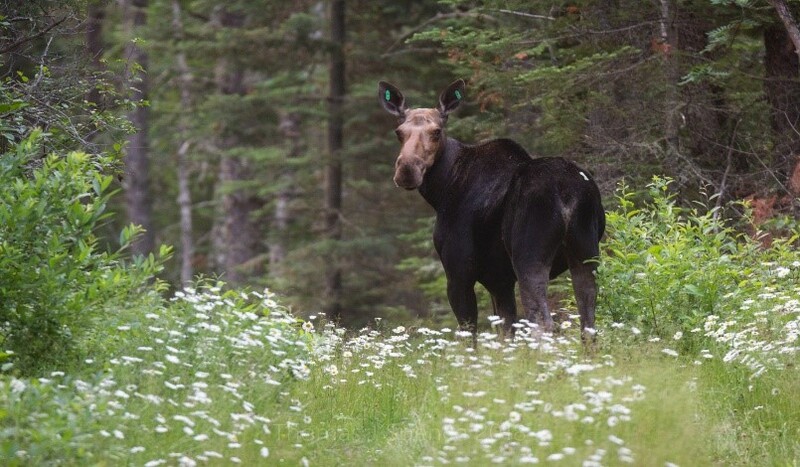 Assessments of habitat used by moose for birthing and rearing calves. To accomplish these objectives, scientists fitted newborn calves with cutting-edge global positioning system (GPS) collars for the very first time worldwide. Having their mothers also fitted with GPS collars, and both collecting locations every hour synchronously for the first two years of the study, allowed researchers to learn so much about maternal movement behavior and patterns relative to their calves, that they were able to continue collecting valuable data for an additional two years without collars being fitted to newborn calves. While field data collection ended in spring 2017, analyses continue. To date, that work has yielded critical information published in 10 peer-reviewed journal articles. Severud, W. J., T. R. Obermoller, G. D. DelGiudice, and J. R. Fieberg. 2019. Survival and cause-specific mortality of calves in northeastern Minnesota's declining moose population. Journal of Wildlife Management. In press. Obermoller, T. R., G. D. DelGiudice, and W. J. Severud. 2019. Maternal behavior indicates survival and cause-specific mortality of moose calves. Journal of Wildlife Management. Severud, W. J., G. D. DelGiudice, and T. R. Obermoller. 2019. Association of moose parturition and post-parturition habitat with calf survival. Journal of Wildlife Management 83: 175-183. Obermoller, T. R., G. D. DelGiudice, and W. J. Severud. 2018. 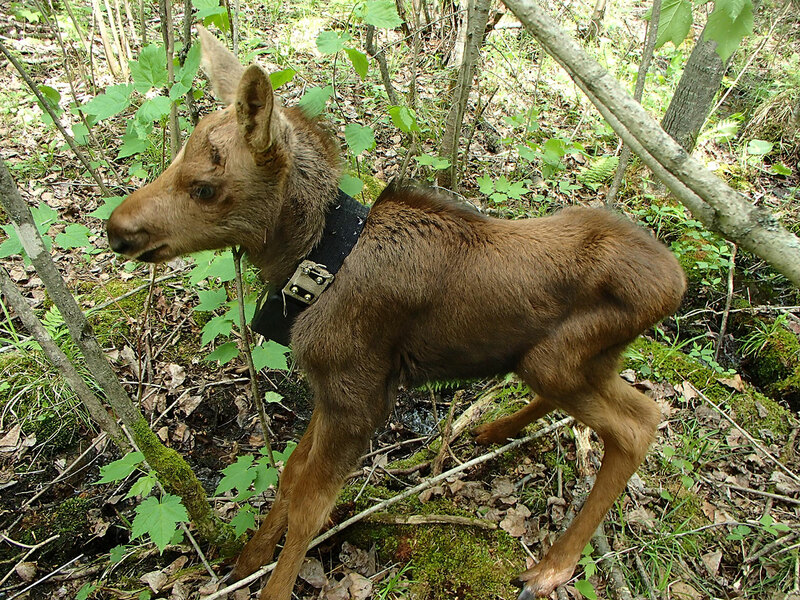 Assessing expandable GPS collars for moose neonates. Wildlife Society Bulletin 42: 314-320; DOI: 10.1002/wsb.878. DelGiudice, G. D., and W. J. Severud. 2016. Blood profiles and associated birth characteristics of free-ranging moose (Alces americanus) neonates in a declining population in northeastern Minnesota. Alces 52:85-99. Severud, W. J., G. D. DelGiudice, and T. R. Obermoller. 2016. Minimizing mortality of moose neonates from capture-induced abandonment. Alces 52:73-83. Severud, W. J., and G. D. DelGiudice. 2015. Potential vertical transmission of winter ticks (Dermacentor albipictus) from moose (Alces americanus) dams to neonates. Journal of Wildlife Diseases 52:186-188. Severud, W. J., G. D. DelGiudice, T. R. Obermoller, T. A. Enright, R. G. Wright, and J. D. Forester. 2015. Using GPS collars to determine parturition and cause-specific mortality of moose calves. Wildlife Society Bulletin 39: 616-625. DelGiudice, G. D., W. J. Severud, T. R. Obermoller, R. G. Wright, T. A. Enright, and V. St-Louis. 2015. Monitoring movement behavior enhances recognition and understanding of capture-induced abandonment of moose neonates. Journal of Mammalogy 96: 1005-1016. Information collected as part of this study is essential to a management understanding that may help stabilize or reverse Minnesota's declining moose population. Click on the topics below for more details on the study's methods and findings. During the four-year study, fertility of adult females was robust, reflected by an average pregnancy rate of 83 percent, which is indicative of good nutritional body condition of most adult females entering the fall breeding season. Average calf production during our study (1,603 calves) was 58 percent lower compared to average calf production during 2006 to 2009 (3,789 calves), just before the moose population sharply declined (2009 to 2012). This was due primarily to the notably lower number of adult females on the landscape in northeastern Minnesota that could get pregnant.